I heard about the "Giant Nerf Battle" in Pekin, IL from the Internet (maybe CJ from ClickClickBamf tipped me off...) about a month ago, so naturally I kept tabs on it. I reached out to the host, followed the Facebook event, CJ was coming in with a few people from his crew out there so naturally, I made preparations to attend. There's an event in Dallas called "Jared's Epic Nerf Battle" and it just wrapped up its 3rd year. 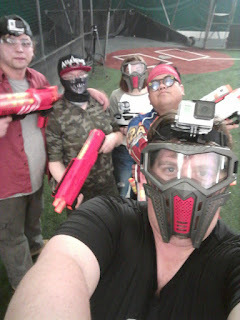 I haven't made it there, so given the proximity (2.5 hours) to go to Pekin vs. the much larger (and costly) trip of going to Dallas, I at least had to try to go to the Giant Nerf Battle. 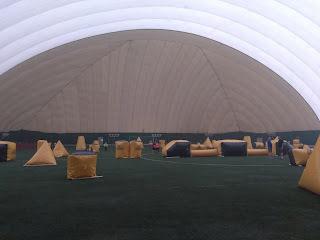 What I knew was it was going to be in the Avantis Dome (pictured above), an inflatable dome somewhere in near Morton, IL. This was a first year event (the host, Mike, had held paintball events before, but this was the first time he was running a "Nerf" type event.) Knowing it was a first time thing, my expectations were low. With any convention, fan event, anything, if it's a year One, I don't expect much. Also, the rules, some promo material, were strangely reminiscent of the materials/videos/rules affiliated with Jared's Epic Nerf Battle. Keeping all this in mind, I didn't really know what to expect but any expectations had to be realistic. The main theme for the games were "Cubs vs Cards" which was basically Red vs Blue... if you showed up with Cubs gear/blue clothing you were assigned to the Cubs side of the field, Red/Cards gear meant the opposite side. A winner was declared at the end of each game, a point given to the Cubs or Cards accordingly. For those who may be scratching your head, Cubs is for "Chicago Cubs" and "Cards" is "St. Louis Cardinals", eternal enemies in Major League Baseball's National League. Each game was going to be 6:00 - the first 3 minutes allowed respawning (run back to your "base" and tag in) and the last 3 minutes meant no more respawns. You couldn't cross the midfield line until the last 1-2 minutes of each game. What that meant to me was to sit in the back until the last 3 minutes, and start then. There was no real incentive/rule to do anything before elimination. People would shoot at me, but all that meant was more ammo on our side of the field. Games would be different themes, different age groups, different blaster types (all Rival, all Dart, I heard there was an HvZ round too) but same time limits each time, with a 10 minute or so break to collect ammo/reload. The crowd looked just under 200 to me, (maybe close to 120 or so, including staff) and games had maybe upwards of 80 people on the field at one time. Final estimates look to be closer to 200 according to the field employees. - Getting inside, the Avantis Dome was a single field with a few bleachers on the side for staging. It was nice enough and the field was big enough to accommodate the crowd. No real complaints there. I'm fielding opinions still on the field itself though... there was turf I think but the ground wasn't very forgiving. I avoided sliding too much or doing any rolling as I had a near 3 hour drive back and didn't want to increase chances of bringing an injury home. According to some folks, turf is supposed to be a bit squishy and soft, definitely not what I think I felt in this case. - There were bunkers, and a lot of them! There was still a lot of space and lines to get your foam through, but the fun part happened when you could finally cross over to the other side. Otherwise I saw people finding favorite obstacles to stay behind or just standing in the open if they were farther back. I think I would have preferred having things a little tighter considering the size of the crowd. It did get intense the closer you got to midfield but the back rows were safe havens practically. - Because it was in a stadium, the "rules" to the event included using only clear/transparent bags on the field. I had reached out to Mike (the host) if this meant we could bring in tubs or other lockable storage so long as we used transparent bags during play, but probably due to the hectic run-up to the event he hadn't responded. I ended up purchasing new transparent bags to bring, but after arriving there it looked like that didn't matter. I saw players showing up in military harnesses and running onto the field and no officials said anything. People were staging out of opaque tubs and no one got stopped there either. I ended up switching out for my usual belt/pouch combo and carried on in spite of the posted rules. 18 under had to keep eye protection on when on the field, and 18+ had it optional. For the most part, I didn't hear about any serious eye injuries. - Lots of families (not surprising) and thus the younger side of 8+, unsurprising for an event like this. Parents would sometimes just be there to help their kid reload or track down ammo, but weren't shooting blasters themselves. Props to them for bringing their kid to something unique like this. - Honor system was... a guideline at best. I recall at least one moment that I had to stare at a kid to get him to respawn after tagging him out. Other players were crossing the 50 yard line before we were "allowed" to do so, referees were apparently not enforcing hits/rules too well (according to the folks I spoke with) and if you tried to tell people yourself I know at least one instance someone got a rude hand gesture for it. Nevermind some of the profanity I heard from adults yelling at kids, or other people just looking to talk garbage to others. Sure, it happens in large crowds but still doesn't make it right. - For the most part the attendees were there to play and burn off some energy/have a good time. Hits weren't super serious to count, and the only real detractor was any rude/off color behavior. We're already getting together to shoot Nerf toys, that's inherently silly as it is. Let's not be jerks while we're at it. I suppose the issue I have with some of lack of enforcement is that there was an actual exchange of money involved here, a ticket purchased. If I wanted to horse around with blasters in a freeform scenario for a few hours I didn't have to drive almost 3 hours to get there and pony up the money for a ticket. I could have gotten some friends together and did that closer to home. - As I mentioned, the rules were loosely enforced so with that in mind it was a loose gameplay experience. The uncrossable line seemed to catch some people off-guard and it didn't matter to other players anyway, as I saw. The problem here seemed to be communication before the event in order to give players ample notice. Again, not that serious to keep to a strict play pattern but if you're going in and paying money you almost want some structured game types to differentiate from what you can do at home. - There was only elimination played, really. I would not have minded an attempt at few different game types like capture the flag or attack and defend variants. Again, this is where communication ahead of time would have been good. At a paintball event, Living Legends, the midfield area has scoring pods (on a hill) and people have to run foam bricks from their side into these pods. I don't know how it would have worked here but something like that might have been a lot of fun with that much foam flying through the air. In a way to just have one game type (and maybe there was a zombies round) constantly played for 3 hours smacks of lack of planning and insight. Sure, it works for the majority of the crowd to have elimination but there is more out there to try out just for fun as well. - No water fountains or stations available. Maybe I can be corrected in the comments, and yes there were in/out privileges for the arena, but if you weren't buying water/refreshments at the concession stand. I think you just had to go thirsty. A concession stand was made available and I appreciate that food and drinks were there, but it seemed off to not even have the option to take a quick drink if you needed it, you had to leave and wait in line. Just seemed odd to me if that was the case. ClickClickBAMF has a whole video on our chat after the event, keep an eye out for that! While it was great that a stadium game happened in Illinois, we weren't sure this was the best foot forward. It was a first year event and had some definite issues, but maybe if they do more events they'll put on a better show. I would like to say I am all ready to get back onto their field for the next game in June, but to be honest, I am neutral to going again. I wish them well on future games though, and hope to see more from Pekin Paintball in the future. For now though, it's just not a good fit for what I want out of paying money to Nerf vs what was presented.